Merced,CA- On Saturday January 6th, 2018 at around 8:00AM, A big rig lost control on south-bound highway 99 between “R” street on ramp and Martin Luther King Jr way exit. 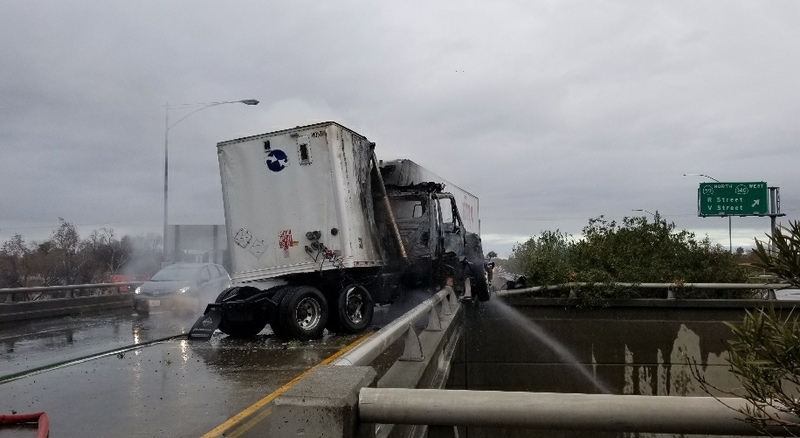 The driver walked out of the accident before the tractor trailer went up in flames, there was diesel fuel going down the drains. The driver was shocked and he only complained of pain in his wrist, No other vehicles involved in the accident, CHP opened the slow lane at around 8:30AM. CHP and Caltrans now say southbound highway 99 fast lane will be closed for approximately eight hours for possible bridge damage. If possible find alternate routes.